Ok, so I must be the only person in the world who could screw up rooting a GNEX. Yet somehow, I have. I have tried rooting using "Nexus Root Toolkit v1.5.2" straight from wugfresh.com...and unlocked without an issue. After what Toolkit said had been a successful root, Superuser was nowhere to be found on my device and no rooted apps were working. Thinking there might have been a problem with the Verizon portion of the process within Toolkit, I re-locked the phone and factory reset it (tryingt to start totally fresh). 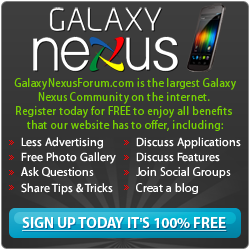 I then went to How to Root Galaxy Nexus! [Universal Guide][GSM/Verizon/Sprint][Windows/Linux/Mac] | GalaxyNexusRoot.com and started following the instructions it gives. I got to step 8 without trouble, but when I typed in the command "fastboot flash recovery optimus_prime-touch-v5.5.0.4-6-toro-VERIZON.im" Command Processor said it failed. I'm attaching a picture of how it went down. When I tried re-entering the same command (maybe not a good idea..?) I think I did something to freeze it because Command won't respond. Hope I've given all the relevant information without being too confusing...hopefully somebody with more experience can help. I've had trouble getting multiple commands to go through in the same session. Not sure why the first flash failed but I'd try a fresh download of recovery, open a new command prompt and try again. Tapped via Galaxy Nexus LTE..
Use a different USB port. Had same issue rooting a Nexus 7. If the file name starts with recovery (usually does) you left out the other recovery. But it stays stuck at sending. This is exactly what happened to me. I just changed USB ports on my laptop and it worked fine. Or open another command window and run the same commands again. Weird I know but it worked. Thanks for the ideas, so far I've tried opening a new command terminal and switching between every USB port on my laptop to no avail...I got the recovery from that website that had all the different kinds of files to root the different kinds of GNEXes, does anyone know what the best site to download just the ClockworkMod recovery for the Verizon LTE version? So I've tried re-downloading CWM and flashing it, trying every USB port and using a new command prompt every time. Is there a problem with my phone possibly? Where it says "FAILED <remote: Invalid Command" ...there is a small blue box at the bottom left corner of the fastboot screen that also sometimes says something similar to that, but it seems to display that message at random times. Not sure what would cause it to say that. Need some help getting my computer setup for unlocking and rooting my phone, please.